Nothing big happening yet, more just a ‘proforma’ posting as the last set rolled off the posting list. There is one ‘odd bit’. I only managed to grab 1/2 the picture, though. When I first checked this page there were 4 red squares sort of semi-symmetrically spread around the globe. I only managed to catch one of the hemisphere images before the other (S. H.) turned blue. Red is ‘in this hour’ so those 4 “went” at almost the same time. It was the little one in the ‘nook’ of South America and the one near Tonga that were both about 3 ish UTC. Looks like a larger one a bit more north in South America and north of Australia were a few hours earlier. At any rate, I’ve noticed that “pattern” in pairs before, where one “goes” in both north and south, or both east and west, at almost the same time. This was the first time I’d seen a ‘quad’ though (though I’ve only recently started looking for that kind of pattern, and you have to catch it within a given hour, so a rigorous search would require checking every 15 minutes or so. Not something I’m going to do. As this Perigee moon progresses, we’re more at risk of quakes. Hopefully nothing big (and not near me ;-) but just pretty patterns. This entry was posted in Earth Sciences and tagged quakes. Bookmark the permalink. Here is a blog written by a Vulcanologist which comments on the latest events. There are a couple of other contributing vulcanologists and knowledgeable geologic types who also comment there. 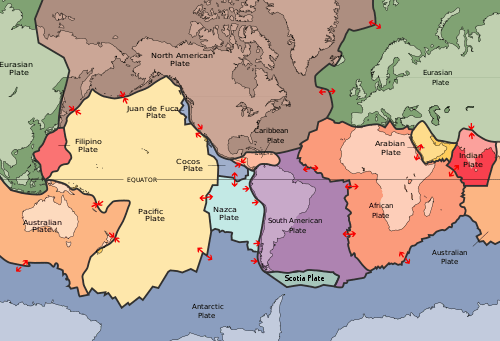 This site wades through the myths and realities of current and volcanic and geologic activity. Oh gravity doesn’t do anything hey. So the moon of Io is different is it lol? @Panther77: It is not gravity only, it´s the whole electromagnetic spectrum. The dead “pebbles universe” is done. Something strange is happening along the east coast of the south pacific; some say El Niño is coming, but….along that coast runs a big and long fault…. Please keep us posted on any news. Quake? Gas Release? Food Supply? Pollution? Good to know what really happened. @Pascvaks: As for the reports of the fishermen dolphins seemed disoriented. Hope more details from our fiend M.Vukcevic, as the once called “South Atlantic Magnetic Anomaly” has largely reached and surpassed occidental coasts of Peru. This is, it seems so, treated a bit secretly, as way back in 1957, during what it was called the “International Geophysical Year” there were two Nike-Hercules rockets launched from the magnetic equator (south of Lima, about 60 kilometers) to study the “equatorial jet” which have had then a sudden change. This issue was touched, a few days ago, too at NIA (http://daltonsminima.altervista.org/) in a commentary by Michele Casati, referring to other cases of disorientation of several species. Well, it seems that it is beginning to be noticed by some humans as an increase in the number of cases of labyrinthitis, which may be also caused by small changes in gravity acceleration. @Pascvaks: It began in the north of Peru (about 500 miles north of Lima), but today has reached Lima beaches, and some of them have been forbidden for the public, in the believe that it could be caused by some bird-flue virus. Biological analysis are in process. Experts suspect that the deaths of animals, especially the pelicans, would be from starvation due to the remoteness of schools of fish or contamination of their food. The ‘First Prosecutor of Crime Prevention’ of Lanbayeque sent samples of dolphins and pelicans, which had died in Lima, to be studied to determine the cause of death. The results are due in 30 days. FWIW I get a “dizzy feeling” just about the time significant quakes are happening. I also have an excellent sense of direction ( I can usually point at magnetic north on request). When I was a small child, my Dad trained me to have a ‘sense of direction’. IMHO this was calibrating the magnetic sense. Humans have the same magnetite granules as other species, just many folks never learned to listen to it. Seconding the notion: Please keep us posted…. Lots of folks get excited about magnetic pole reversals and forget that excursions are much more common. This is likely to cause a lot of issues for animals that have become dependent on their magnetic sense (instead of just using it when it works well and ignoring it when it’s a bit off). Según el Instituto del Mar del Perú (Imarpe), hasta el 29 de abril se registraron 592 aves marinas muertas, entre ellas pelícanos y piqueros; así como unos 900 delfines, cinco ejemplares de lobos marinos y una tortuga marina muerta en 70 kilómetros de playa, al norte de la caleta de San José, en Lambayeque. According to the Peruvian Institute of the Sea (www.imarpe.gob.pe) until April 29th were found 592 dead birds, among them pelicans and “piqueros”(boobies? ); and about 900 dolphins, five sea wolfs and one dead turtle along 70 kilometers of beach, at the north of small port of San Jose, at Lambayeque. (my translation). Well, not much came of the SuperMoon… though I notice that California is down to 357 on that map in this “post-super” time. Also, for this hour only, the N.Hemisphere and S.H. maps have another of those curious symmetries. A quake near the Strait of Hormuz / Qatar and one just north of Australia. Almost exactly opposite sides of the world again. I’ve seen that often enough to think something is going on…. Set it at California, then play from 7 am to 14 pm, you will see a gathering of Sun + Mercury + Moon and Jupiter. An annular eclipse plus Mercury and Jupiter. @Pascvaks: That´s improbable due to Coulomb´s Barrier. Just a bit shy of 5.x at 4.8 in East Texas!? Overall, it looks a bit ‘light’ on quakes post super-moon. Still, a couple of interest happened. Well, the global frequency of M6 quakes is about 2 quakes every 3 days or so. So M6 are rather frequent things. So over a period of 30 days you should see about 15 to 20 M6 quakes. @E.M.: That´s in the southern part of the Nazca plate. A Big one is expected where it happened the last 6.2 earthquake, at the frontier between Peru and Chile, as it happened during the Maunder Minimum. @E.M.: The party has begun!…are you going to Reno? Quakes in volcano land get a bit more interest, too, to see if they are on a volcano. So this one in Italy is interesting just because it means “Check quakes near Italian Volcanoes”. We watched it via a pinhole in a cardboard sheet. Nice image projected on almost any flat surface. @EMSmith; I see you had a nice little 3.5 bump today. We also had a 3 up at Lake Almanor. pg. Yeah, and count is headed back up toward 400 after a big drop down to 375 or so. Looks like a 4 off the Channel Islands.